Wine does a lot of things to people. It evokes joy, it livens your tastebuds, it might even make you melancholy. It can also make you a little Sideways. When last we saw erstwhile Miles and sidekick Jack in the novel Sideways (and the subsequent movie which while it’s one of my favorite wine movies ever, is not exactly true to the book…ok most movies aren’t but still. If you haven’t read the book READ THE BOOK!) Jack was married (perhaps ill advisedly) and Miles was reconnecting with The One – Maya. Now, several years have passed, and Vertical explores Miles’ life after Santa Barbara. If you remember Sideways, you know that Miles has a troubled relationship with his mother. Now aging and unwell, Miles has the unwelcome task of caring for her, and helping her move to another state so she can spend her final days with her estranged sister. Miles has tried and failed, and tried again, quit drinking, and is attempting to ride out the success of his now published novel, without much luck. The demands of his publishes and commitments for press engagements are pushing him in to a hole as deep as the one he was in when the book wasn’t publishable at all. Bring in Jack, who’s philandering ways and hard drinking habits have now landed him in hot water woith his now ex-wife. Both a buddy road trip story and a bittersweet look at the life of two middle aged best friends, Vertical explores the relationships of two friends, for good or bad, as they muddle through the difficulties of every day life, love, alcohol abuse and aging parents. Vertical is tragically sad in places, and hilariously funny in others, in a way sideways was not. I find it much more real, honest, and open in looking at the realities of life. I can’t recommend this follow up enough, particularly if you read the book Sideways, and didn’t just watch the movie. Vertical follow it up with the realities of fame, the perils of life, and how you balance the two. I’m thrilled to announce that Rex will be speaking in person at the 10th Annual Pinot Summit on February 25th in San Francisco. After hosting a #winechat twitter session a few weeks ago, I find him engaging, self deprecating, humorous and absolutely delightful. You can follow him on Twitter as well. I hope you can join us for this one of a kind event! 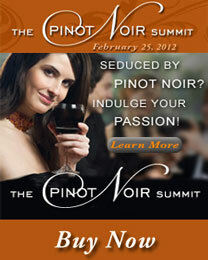 Tickets are $130 for a full day of Pinot tasting, educational seminars, and the Grand Awards. Alternatively, you can opt for the Grand Awards tasting only. I am trying to do more book reviews now. I read like someone from Freaks & Geeks, and occasionally I get press copies for review. This one however, I bought for myself.